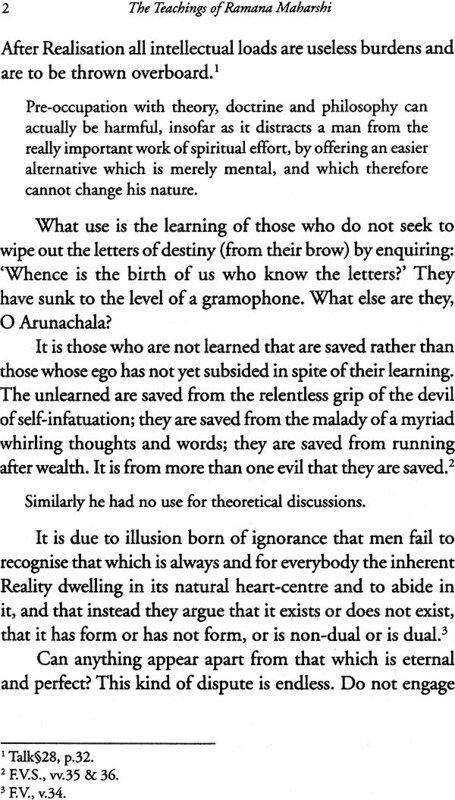 In Teachings of Bhagavan Sri Ramana Maharshi in His Own Words Arthur Osborne has succeeded in presenting in a brief compass the essential teaching of the Maharshi, through a process of selection from his dialogues and written works. The matter has been classified under distinct subjects. This book fulfills the need for a short, reliable compemdium of Sri Bhagavan’s instructions-which in earlier years were available mostly in the form of diaries. The notes of the author are of great value. Arthur Obsorne (1906-70) was one of the most well known of the devotees of Ramana Maharshi. He is particularly well known for his work as founder-editor of The Mountain Path. the spiritual journal published by Sri Ramanasramam. He was its Editor till 1970. An Oxford graduate in history, he was on the faculty of chaulangkorn university in Bangkok, Siam. He was interested for sometime in the 1940’a by the Japanese 9during World War II). After release and evacuation in 1945, he came to India-staright to the Ashram of Maharshi. His family members were living there, already. He sought refuge at the feet of Maharshi and became an ardent devotee. So did his family members. 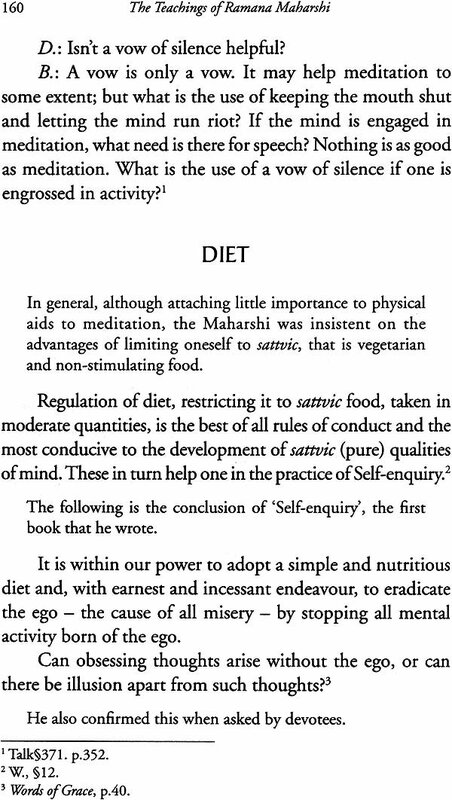 Arthur Osborne is the Editor of the Collected Works of Ramana Maharshi. 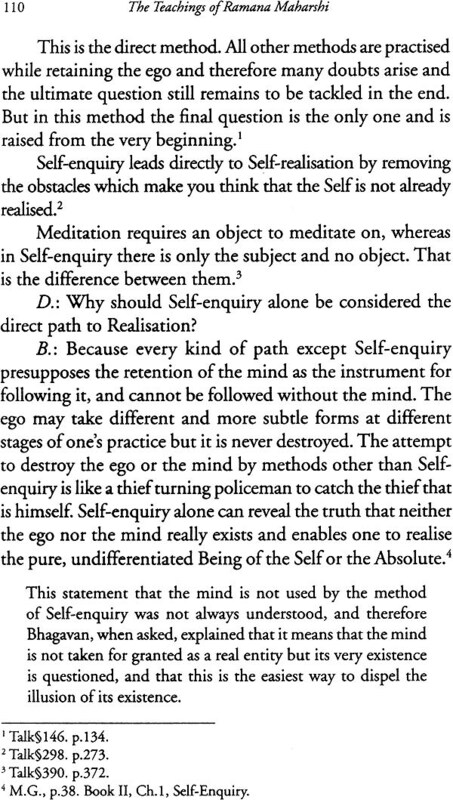 Another Popular work of his is Ramana Maharshi and the Path of Self-Knowledge. He has many other works to his credit. 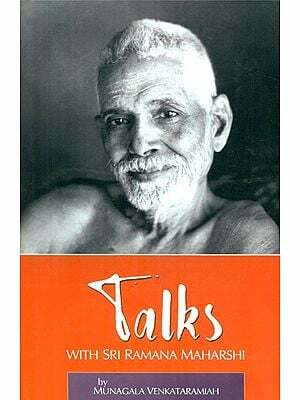 During the half century and more of his life at Tirvannamalai, Bhagavan Sri Ramana Maharshi was visited by a constant stream of people from all parts India, and by many from the West, seeking spiritual guidance, or consolation in grief, or simply the experience of his presence. 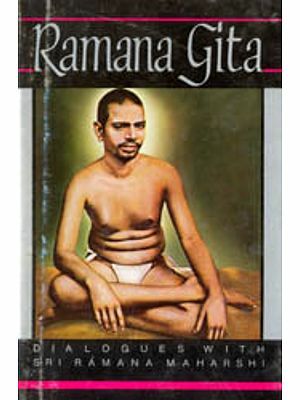 He wrote very little all these years, but a number of records of his talks with visitors were kept and subsequently published by his Ashram. These are mostly in dairy form, with little arrangements according to subject. 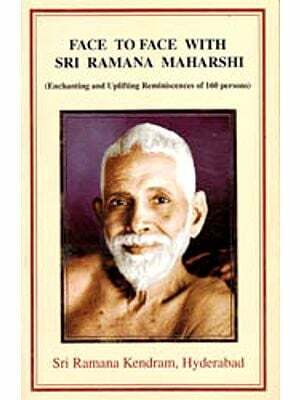 The purpose of the present book is to build up a general exposition of the Maharshi’s teachings by selecting and fitting (published as The Collected Works of Sri Ramana Maharshi, by Messrs. Rider & Co., in England and by Sri Ramanasramam in india). The editor’s comments have been kept to a minimum and are printed in smaller type to distinguish them clearly from the Maharshi’s own words. It was a about six weekend before I felt Maduari for good that the great change in my life took place. It was sudden. I was sitting alone in a room on the first floor of my uncle’s house. I seldom had any sickness, and on that day there was nothing wrong with my health, but a sudden violent fear of death overtook me. There was nothing in my state of health to account for it, There was nothing in my state of health to account for it, and I did not try to account for it or to find out whether there was any reason for the fear. I just felt ‘I am going to die’ and began thinking what to do about it. It did not occur to me to consult a doctor, or my elders or friends ; I felt that I had to solver the problem myself, there and then. The shock of the fear of death drove my mind inwards and I said to myself mentally, without actually framing the words ‘Now death has come; what does it mean? What is it that is dying? The body dies. ‘And I at once dramatised the occurrence of death. I lay with my limbs stretched out stiff as though greater reality to the enquiry. I held my breath and kept my lips tightly closed so that no sound could escape, so that neither the word ‘I’ nor any other word could be uttered. ‘Well then’, I said to myself, ‘this body is dead. It will be carried stiff to the burning ground and there burnt and reduced to ashes. But with the death of this body am I dead? Is the body I? It is silent and inert but I feel the full force of my personality and even the voice of the “I” within me, apart from it. So I am that transcends it cannot be touched by death. 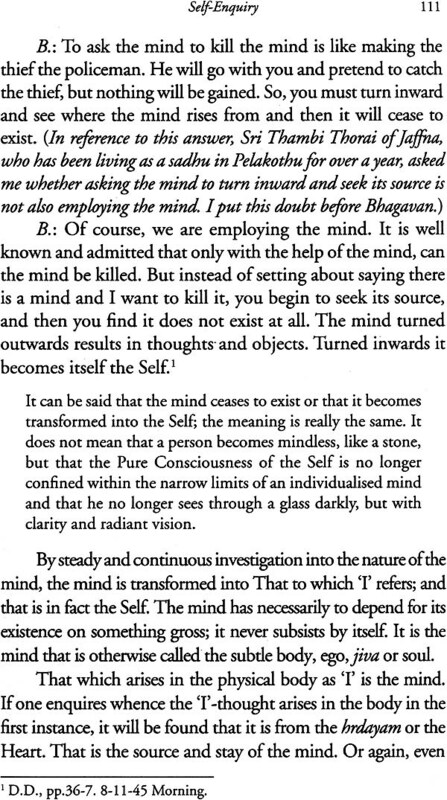 That means I am the deathless Spirit.’ All this was not dull thought; it flashed through me vividly as living truth which I perceived directly, almost without thought-process. ‘I’ was something very real, the only thing about my body was centred on that ‘I’. From that moment onwards the ‘I’ or Self, focused attention on itself by a powerful fascination. Fear of death had vanished once and for all. Absorption in the Self continued unbroken from that time on. It is the last sentence that is the most remarkable, because usually such an experience soon passes, although the impression of certainity that it leaves on the mind is never afterwards forgotten. Very rare are the cases when it remains permanent, leaving a man thenceforth in constant identity with the Universal Self. Such a one was the Maharshi. Soon after this change occurred, the youth who was later to be known as ‘the Maharshi’ left home as a sadhu. He made his way to Tiruvannamalai, the town at the foot of the holy hill of Arunachala, and remained there for the rest of his life. I had read no books except the Periapuranam, The Bible and bits of Thayumanavar or Thevaram. My conception of Ishwara was similar to that Found in the Puranas, I had never heard of Brahman, samsara and so forth. I did not yet know that there was an essence or impersonal Real underlying everything, and that Ishwara and I were both identical with it. Later at Tiruvannamalai, as I listened to the Ribhu gita and other sacred books, I learned all this and found that that books were analyzing and naming what I had felt intuitively without analysis or name. 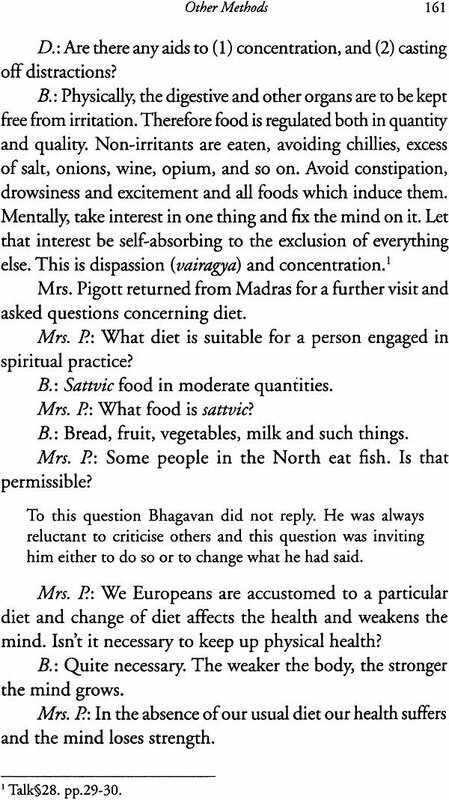 Perhaps something should be said about the Maharshi’s way of answering questions. There was nothing heavy or pontifical about it. He spoke freely and his replies were often given with laughter and humour. If the questioner was not satisfied, he was free to object or ask further questions. It has been said that the Maharshi taught in silence, but this does not mean that he gave no verbal expositions, only that these were not the essential teaching. That wsa experienced as a silent influence in the Heart. The power of his presence was overwhelming and his beauty indescridable, and yet, at the same time, he was utterly simple, utterly natural, unassuming unpretentious, unaffected. 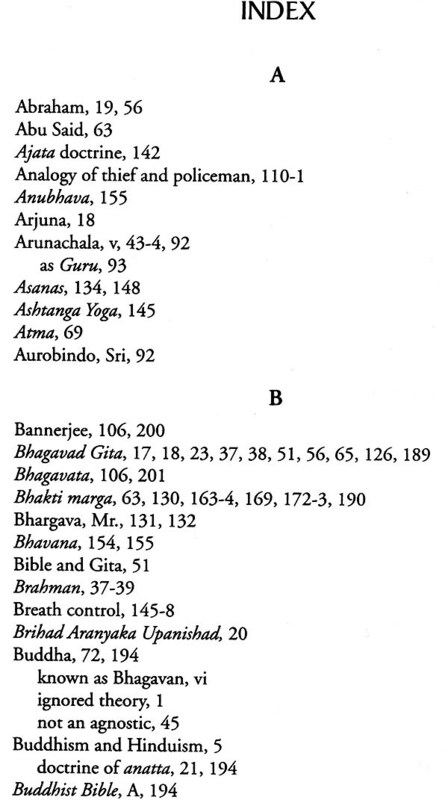 So far as is possible, Sanskrit words have been avoided, and it usually has been possible. The purpose of this is to make the book easier to read, and also to avoid giving the false impression that the quest of Self-Realisation is some intricate science, which can be understood only with a knowledge of Sanskrit terminology. It is true that there are spiritual sciences which have a necessary technical terminology, but they are more indirect. 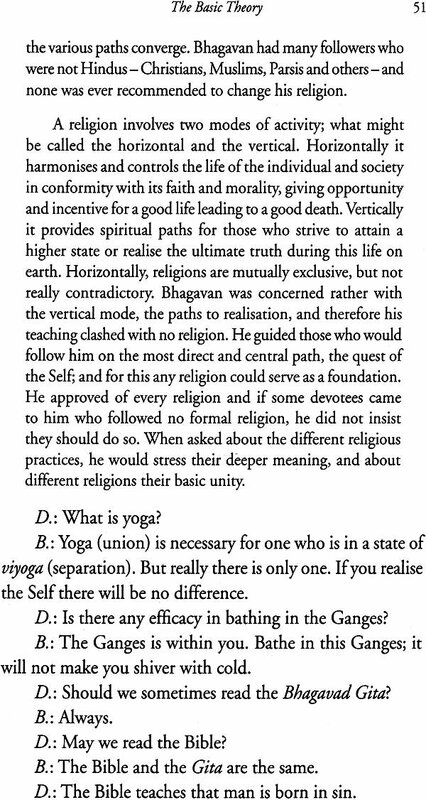 The clear and simple truth of non-duality which Bhagavan taught, and the direct path of Self-enquiry which he enjoined, can be expounded them so to Western visitors, without having recourse to Sanskrit terminology. In the rare cases where a Sanskrit term has seemed necessary or useful in this book, its approximate meaning has been indicated in brackets, so that the English words- Enlightenment, Liberation, and Self-Realisation is some intricate science, terminology. 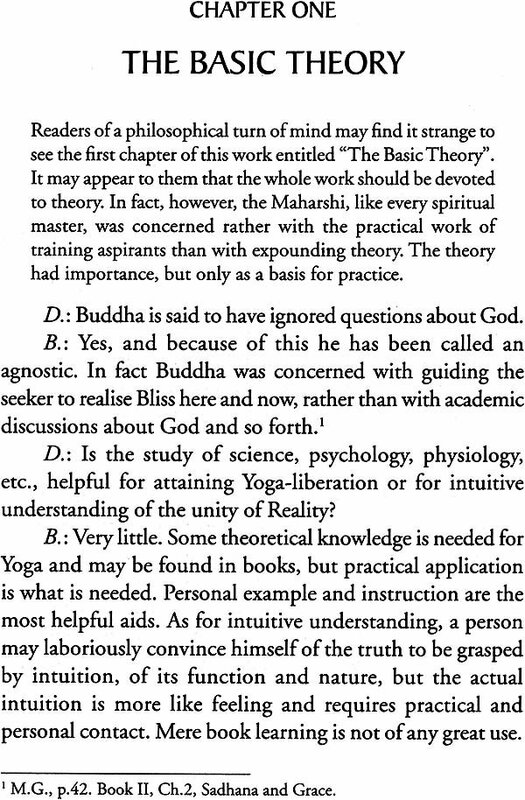 It is true that there are spiritual sciences which have a necessary technical terminology, but they are more indirect. 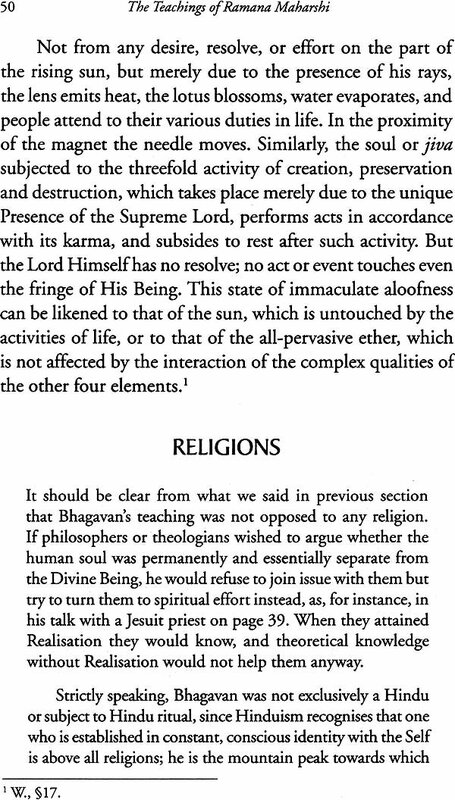 The clear and simple truth of non-duality which Bhagavan taught, and the direct path of Self-enquiry which he enjoined, can be expounded in simple language; and indeed, he himself expounded them so to Western visitors, without having recourse to Sanskrit terminology. 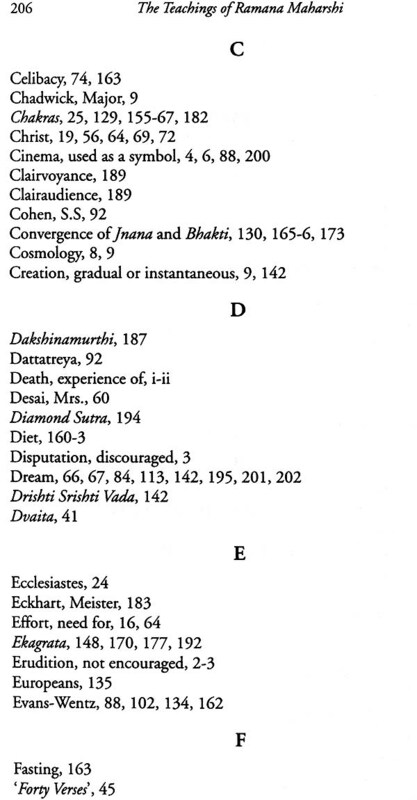 In the rare cases where a Sanskrit term has seemed necessary or useful in this book, its approximate meaning has been indicated in brackets, so that no glossary is necessary. It may also be remarked that the English words-Enlightenment, Liberation, and Self-Realisation have all been used with the same meaning , to correspond with the Sanskrit words Jnana, Moksha and Mukti. In Places where the English of the source quoted seemed infelicitous, it has been altered. This implies no infidelity to the texts since the replies were mostly given in Tamil or other South Indian languages, and later rendered into English. The meaning has not been changed.